James Bond: Is this the only room there is? James Bond: But we’re supposed to be married. James Bond: Yes, but we must keep up appearances. We’re on our honeymoon. James Bond: [pushing aside his oyster dinner] Well, I won’t need these. Helga Brandt: [Bond is captured by Helga Brandt] I’ve got you now. James Bond: Well, enjoy yourself. Aki: You wouldn’t touch that horrible woman, would you? 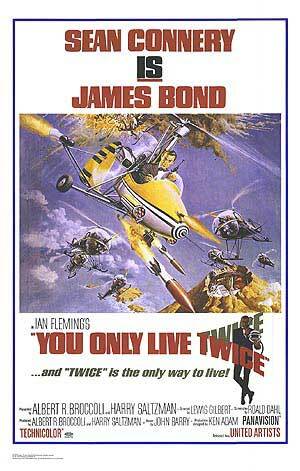 James Bond: Oh heaven forbid. James Bond: Little Nelly got a hot reception. Four big shots made improper advances toward her, but she defended her honor with great success. James Bond: If you’re Tanaka, then how do you feel about me? Tiger Tanaka: [the code response] I… love you. James Bond: Well, I’m glad we got that out of the way. James Bond: Why do Chinese girls taste different from all other girls? James Bond: No, just different. Like Peking Duck is different from Russian Caviar. But I love them both. James Bond: Well, I’ll just settle for this little old lady here. Tiger Tanaka: Good choice, she’s very sexyful. James Bond: And rule number two? James Bond: I just might retire to here. MoneyPenny: Oh, by the way, how was the girl? James Bond: (turns the lamp towards her, interrogation style) Which girl? MoneyPenny: The… uh… Chinese one we set you up with? James Bond: Another few minutes and I would have found out. Tiger Tanaka: [after Tiger’s helicopter drops an enemy car chasing Bond and Aki into the Pacific ocean] How’s that for Japanese efficiency? James Bond: Just a drop in the ocean. Tiger Tanaka: [discussing Osato Chemicals’ supertanker, the Ning Po, which is known to be smuggling rocket fuel] We shadowed the Ning Po to the outer islands. Aki: It was very dark. Hard to see her all the time. Tiger Tanaka: But we know she stopped somewhere. Look at these photos. Aki: Look at the water line. James Bond: [noticing the higher water line of the ship in seperate photos] You’re right. Fully laden here, and empty here. James Bond: [getting up] I want to take a look at the island now. Is Little Nellie here? James Bond: [sarcastically] Welcome to Japan, Dad. Is my little girl hot and ready? Q: [annoyed] Look, 007, I’ve had a long and tiring journey, probably to no purpose, so I’m in no mood for juvenile quips. M: [buzzing intercom] Miss Moneypenny, give 007 the password we’ve agreed with Japanese S.I.S. MoneyPenny: We tried to think of something that you wouldn’t forget. James Bond: Don’t worry, I get it. James Bond: Uggghhh… Siamese vodka?